Who’s looking forward to seeing Tim Burton’s Alice in Wonderland? I am! I’ve been looking forward to seeing it is since last year when the first promotional photos were released. Now, it’s only a matter of two days! These instant “ice creams” are fruit-based and are dairy-free, the only ingredients are fruits, frozen or fresh or a combination thereof. The key ingredient is frozen banana. The banana must be frozen to act as a base and is what gives the “ice cream” its thick, smooth consistency, otherwise it will just be a smoothie. Whether the other fruit is fresh or frozen doesn’t matter. This is best done with a hand blender in a container. Once made, it’s best that this is eaten immediately! It shouldn’t be stored in the freezer for a prolonged period of time (unless under controlled temperatures), or for at least a very short duration (about 10-15 minutes); otherwise it hardens like regular melted ice cream hardens when refrozen. The sweetness of the “ice cream” is determined by how sweet the fruit is that’s used. You can use just fruit (no additional liquid), or use a small amount of almond, soy, or rice milk, or water. 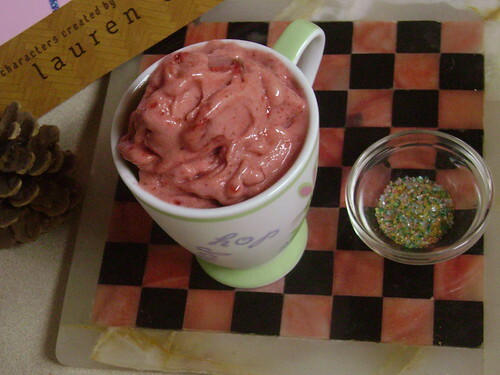 The instant “ice creams” pictured were made with only fruit, without any additional liquid. Aside from these combinations, you may choose any fruit to go with the frozen banana. Use as much fruit as you like with the frozen banana. 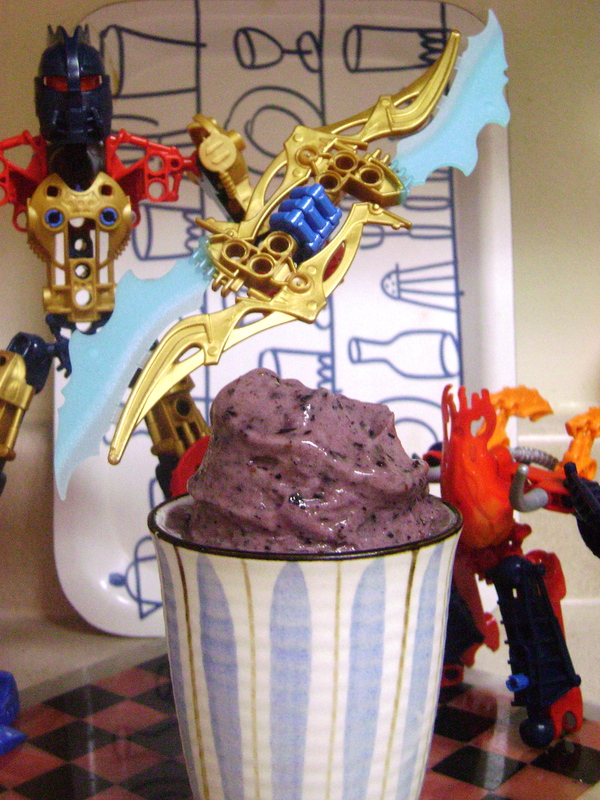 For the Red Queen instant “ice cream”, use frozen banana and strawberries; for “Absolutely Alice”, frozen banana and blueberries. A White Queen version could also be made by using just frozen banana. Put the frozen banana and berries in a container that is big and deep enough so that the hand blender doesn’t splatter. Add a small amount, about 1/4 to 1/2 cup depending on amount of fruit, of almond, soy, rice milk, or water, if using. The milk or water should be below the fruit level, otherwise it will just be a milkshake. Carefully blend the fruit with the hand blender until the banana chunks begin to break down and become a smooth, thick consistency. Blend until all the ingredients have turned into this consistency and there aren’t any lumps or chunks of fruit. It will be very thick. Unplug hand blender and serve in bowls or small glasses. Eat immediately. Enjoy! I haven’t used yogurt but I have used that dairy-free custard that I posted about here, which (I think) tastes like those milkshakes you get at McDonald’s or someplace but much healthier! That will be another recipe I’ll be posting in the near future, now that spring is here and summer is practically around the corner. I used to be tempted to add ice cream and yogurt and things to thicken it up but with the fruit being frozen it adds a nice texture. I pointed the bionicles out to my little brother who thinks it is the funniest thing and now calls his tweedledum and tweedledee! I am hungry for this and hope I can use the blender this late without waking my family!! !